Read about Bali's attractions, shopping & dining options, accommodation options, tours and more and get ready for your trip to this heaven on earth. Bali's nickname is the "Island of the Gods." Visitors soon understand how Bali got this name when they are introduced to this paradise on earth. Bali is a province of Indonesia. It is also one of the many islands of the nation of Indonesia. Kuta is the best-known city on the island of Bali, and it is located near the international airport. Bali's scenery is spectacular and varied: sandy beaches and rugged coastlines, terraced rice fields and tropical forests, volcanoes and lakes. But paradise consists of more than scenery: the Balinese people are known for their friendly smiles and their hospitality. Many visitors are fascinated by the religious and cultural traditions they observe in Bali. It is a unique blend of animism and Hinduism, and for many Balinese, it is a way of life, something that is a part of their daily routine. Visitors walk through a village and hear a gamelan orchestra rehearsing for that evening's "wayang kulit" (shadow puppet) performance. Beautiful women in traditional attire with offerings of fruit piled high on top of their heads walk to a nearby temple. These sights and sounds are not part of a performance for the benefit of tourists: these are everyday activities for the Balinese, activities that have great spiritual meaning for the Balinese. Many Balinese traditions come from the Hindu religion, and Bali is the home to many of the country's Hindu minority, as Islam is the predominant religion of Indonesia. The first Hindus arrived on Bali over two thousand years ago. Bali was ruled by the Javanese Majapahit Empire and the Balinese adopted many aspects of the Javanese culture, such as architecture, dance, painting and wayang kulit. There are several very small isolated areas on Bali where communities retain the pre-Majapahit ways of life. This is called "Bali Aga," or "original Balinese," and these people are found in the villages of Tenganan near Candidasa, and in the village of Trunyan on the eastern shore of Lake Batur. Bali is the name of one of Indonesia's islands. But it is also the name of one of Indonesia's provinces. The province of Bali consists of the island of Bali as well as several other smaller neighbouring islands. It is located just east of one of the larger islands, Java, which is home to the Indonesian capital city of Jakarta. To the east of Bali is Lombok, and several islands further east is the island of Komodo, the home of the famous Komodo Dragon. Bali is located just eight degrees south of the equator. Most tourists arrive at the Ngurah Rai International Airport, which is sometimes referred to as the Denpasar International Airport. Although Denpasar is the largest city on Bali, the airport is actually located closer to Kuta, which is popular with tourists, mostly because of its proximity to the airport, and because of its sunny climate, sandy beach and its famous nightlife. There are several forms of transportation that are available from the airport, depending on one's final destination. Some hotels offer shuttle services; there are also public taxis, and, just outside of the airport, there are local "bemos" which are shared minivans. There are so many fascinating and diverse things to see and do on Bali. Many tourists arrive at the airport, and are perfectly happy to stay in Kuta, swimming, soaking up the sun, and experiencing Kuta's wild nightlife. Many people travel north to Ubud, the cultural centre of Bali. Here there are museums, dance performances, art galleries, craft shops, and a monkey forest. To the east is Mount Agung, the highest mountain on Bali, and the home of Besakih, the "Mother Temple." This is the most important spiritual place on the island for the Balinese. Nearby is Lake Batur and Mount Batur. Mount Batur is an active volcano, and the villages around the lake serve as a starting point for the early morning hikes to the top of the volcano to watch the sun rise. Klungkung is an important town south of Lake Batur and Mount Agung: it was the seat of the Majapahit Empire during the 15th and 16th centuries. Taman Gili is what remains of the royal family's palace. 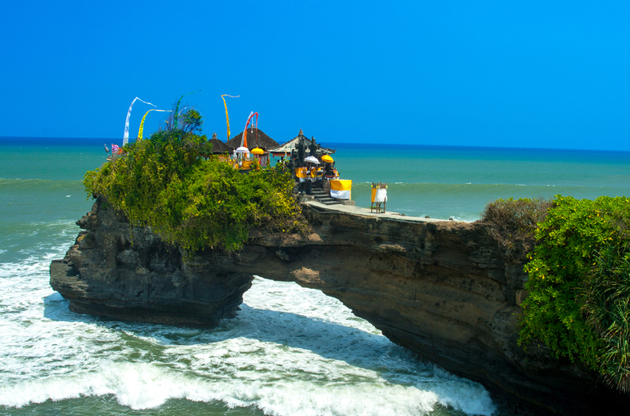 On the west coast of Bali is found Tanah Lot. This is the home of an interesting Hindu temple perched on a rock just off the coast. Shopping is quite easy on Bali: there are tons of opportunities. In Denpasar look for Pasar Badung for produce and food, and Pasar Kumbasari for fabrics and handicrafts. Sanur is famous for its many art markets, such as Jaya Kesuma Art Market, Pasar Sindhu Art Market, Sanur Beach Market, and Shindu Beach Market. Sidemen is well-known for culture and arts, and Pelangi Weaving is a good place to look for fabrics. Near Tabanan is CV Keramik Pejaten which produces traditional pottery. If Bali is paradise, Ubud is a shopper's paradise. Try Ary's Bookshop for books and maps, Ashitaba for rattan products, Bali Cares for handicrafts and paintings, Batavia 1885 for bowls, puppets, statues and urns, Ganesha Bookshop for books, Kou for handmade organic soaps, and Pasar Seni for clothing and sarongs. Because of the influx of international visitors, there is quite a large variety of cafes and restaurants serving cuisine from many parts of the world. There are many American chains, especially in Kuta, but, interestingly enough, they often adapt their menus to suit local tastes. To experience local fare, visitors can try nasi goreng (fried rice) or nasi campur (rice with vegetables and meats). Padang restaurants serve Indonesian food, particularly spicy food from Padang, Sumatra, but not necessarily Balinese food. Balinese food focuses on pork, and some of these dishes include babi guling (roast pig) and Urutan (spicy pork sausages). Non-pork dishes include bebek betutu (duck), lawar (many different kinds of salads), and sate lilit (seafood satay). The centre of nightlife on Bali is Kuta. Many bars feature a happy hour around sunset, and tourists can sample some of the local alcoholic beverages like Indonesia's Anker, Bintang, Bali Hai and Storm beers. Bali's locally produced wine is called Hatten, and its most popular liqueur is called Bali Moon. For visitors staying in the Kuta or Denpasar areas of Bali, the most popular tour is a visit to Ubud, Bali's artistic and cultural centre. Other tours include a visit to Besakih on Mount Agung, Lake Batur and nearby Pura Ulun Danu Temple, and the Tanah Lot Temple on the west coast. On the north side of the island are found Lovina and Singaraja, and to the east are found Amed, Candidasa, and Klungkung. Bali is becoming of the predominant places on world's international events scene. Although the city is famous for being a piece of heaven on earth for leisure travel, it is possible to say that it offers a dream trip for event attendees who travel to the island to attend one of the international congresses, conferences, symposiums, seminars, trade shows or fairs.